Tomorrow morning, the future of U.S. space travel could change forever. At 11 a.m., the 4-hour launch window will open at Cape Canaveral for Falcon 9, a rocket designed by Hawthorne, CA.-based SpaceX, which has been contracted by NASA to carry cargo to the International Space Station beginning next year. The company, helmed by Wharton grad Elon Musk, C’97, W’97, is at the center of the Obama administration’s controversial efforts to transfer some of NASA’s traditional duties—including transportation to the space station—to private companies. 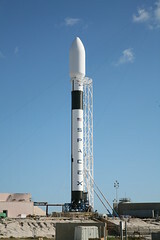 SpaceX, whose privately developed Falcon 1 made history by reaching orbit in 2008, is an acknowledged leader in this emerging field. And the company’s goal is nothing less than a space travel revolution. If all goes as planned, Falcon 9’s currently unmanned test capsule, “Dragon,” will someday carry passengers into space—at a significantly lower cost than traditional methods. While it will take much more than a single launch by a single company to determine success or failure, Falcon 9’s reaching orbit tomorrow would go a long way towards allaying fears that space travel is simply too big, too complicated and too important for NASA to entrust to commercial interests. Of course, Musk, who reportedly provided inspiration for the characterization of Tony Stark in Jon Favreau’s Iron Man movies, is no stranger to big, complicated and important. In addition to his work as chief executive officer and chief technology officer of SpaceX, he serves as CEO and Product Architect of Tesla Motors, a leader in the development of electric cars, and non-executive chairman of SolarCity, California’s leading provider of solar power systems. Oh, and he’s also co-founder and former Chairman and CEO of PayPal. SpaceX will be showing the Falcon 9 launch on a live webcast: http://www.spacex.com/webcast.php —so tune in tomorrow to see if the “Iron Man’s” Falcon will really fly.